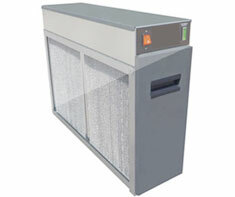 An Electronic Air Cleaner is an appliance that removes dust particles, smoke, pollen, spores, etc. from the air and improves your home health. Most electronic air cleaners remove 95% of the particulates in the air versus a standard furnace or air conditioning air filter which only removes about 10%. Electronic Air Cleaners come in two types: central systems which are installed as part of the ductwork in your home's central air distribution system; and self-contained units which typically sit on the floor or a table, and just clean the air in one room. Electronic Air Cleaners make room cleaning easier and less frequent, help improve inside air quality, and help to provide relief to allergy sufferers. Central Air Conditioning and Forced Air Heating. Shown in the 'Routine Care' section are the recommended routine maintenance tasks for your electronic air cleaner. The 'Q & A' section shows answers to common questions. And the 'Articles' section provides helpful articles about your electronic air cleaner.